Joan Didion has 3 media appearances. An hour with author Joan Didion about "The Year of Magical Thinking"
Mash-ups can produce musical experiences that become more than the sum of their parts, but what happens when major labels don’t want you to hear them? Join EPL on Tuesday, February 26th when Freedom to Read Week becomes Freedom to Listen! This talk’s focus will be Danger Mouse’s notorious Grey Album—fusing together The Beatles’ “White Album” and Jay-Z’s Black Album—as well as copyright issues and mash-up culture as a whole. 1954: The United States Senate censures Senator Joseph R. Mc Carthy of Wisconsin. 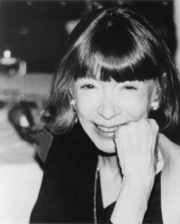 Joan Didion is currently considered a "single author." If one or more works are by a distinct, homonymous authors, go ahead and split the author. Joan Didion is composed of 8 names. You can examine and separate out names.